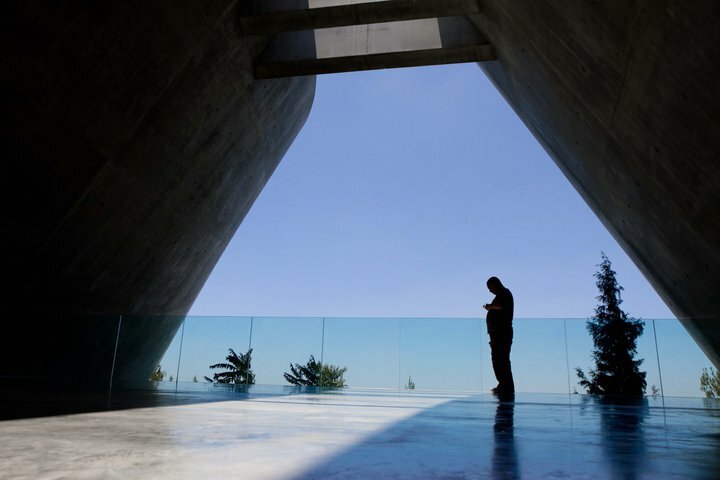 Tour and Train at Yad Va Shem, Jerusalem, learning about the past, preparing for the future, honoring the victims. 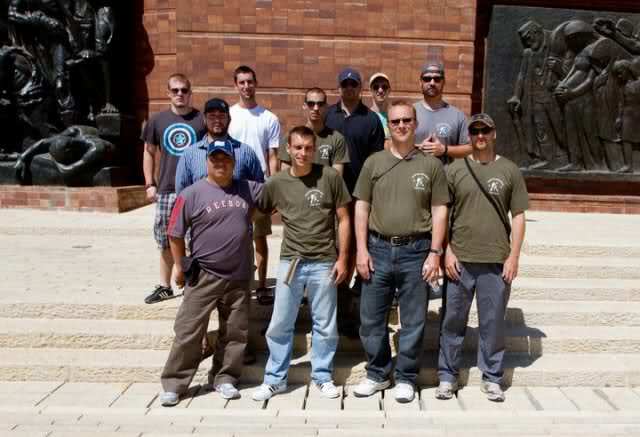 There are many different Krav Maga schools and associations. They are not all the same. The differences are too great to enumerate here. However I would like to focus on one point, one aspect of philosophy. The great American-Jewish poet Emma Lazarus wrote, "Give me your tired, your poor, your huddled masses yearning to be free". This is a good start, but not inclusive enough. The other day I was in Yad Va Shem. The memorial to the Dark Years, known as Shoah, or the Holocaust, the years when the world went mad. I heard again the tragic story of the Lodz ghetto in Poland. The tragic speech delivered by the head of the Jewish council, explaining the Nazis latest demands; anyone unfit to work was not worthy of life and could not stay in the ghetto. (i.e. would be sent to a death camp). The very young, the old, the weak and the frail, the sick and the handicap had no right to life. No words can express this tragedy and I shall not attempt to do so. Such pain is not expressed in words. But a thought occurred to me. Society is composed of many types of people. Many ethnic groups, many personalities, many age groups, many body types. We are a grand bag of "mixed nuts". This is who we are and we are all responsible for each other. This is a community. When I think of some of the other approaches to Krav Maga I feel this sense of collective community is violated. I hear things like "Military Krav Maga", think about it. The vast majority of soldiers are young and fit. They are full time soldiers, this is all they do. They stand erect, they are at their peak. Imagine the image of the classic Roman soldier, the Greek soldier. Imagine the posters during World War Two in Europe; the perfect male and female. I think of the deportations from the ghetto when they came and first emptied out the "useless" people. They came to the hospitals, to the orphanage, they took the people that "did not matter". The weak were the first to die. I picture our society; women with baby carriages, old people walking with canes, children and adults and I think; they all have a right to live. And I look at our art, Krav Maga, and I ask; can we provide a solution for everyone? Can I find methods that even an old person stands a fighting chance to deter an assailant? a method where a woman pushing a baby carriage can defend herself? There are styles out there that are really geared towards Olympic athletes, that demand incredible strength and agility. But on our holy days we pray, "Do not abandon us in our old age, do not leave us when our strength is gone". This is a prayer which we must take upon ourselves as well, not leave only to God. Teach us a form of Krav Maga that will not abandon us in our old age, that will not fail us when our strength is gone. Dr. Alberta Labra from Mexico, at the exit of Yad Va Shem, from death to life, from darkness to light. Tour and Train Israel Experience. And behold it is true! But yet they are not entirely safe. And so daily we train and develop a new way of Krav Maga, not for a super race of young athletes, but for everyone, for our community. There are no lesser members of society, there is no super race. That ideology is dead and gone! Everyone has a right to life, and dignity, no one is dispensable. As Moshe (Moses) said to Pharaoh, "We shall go with our youth and with our old people". None shall be left behind. Indeed this is our challenge. We shall all be old someday, (we hope) we were all children once; helpless and dependent on others. We were all once pushed in a baby carriage and we might someday be pushed in a wheel chair. "Give me your tired..." Krav Maga for everyone.